Lunch will be served at 12.30 noon. In the years spanning 1869 and 1948, the globalization of capitalist relations, the improvement of transcontinental travel and worldwide communication, as well as the tolerant political regimes provided the milieu in how modernization of music consumption instigated the ‘uniformization’ in the commodification of various cultural products and processes, while simultaneously fragmenting societies into distinct identities, institutions, and nascent nation-states. In the period that Hopkins (2002) calls the age of modern globalization, and what Bayly (2004) historically marks as the ‘beginning of the modern world,’ when colonial Southeast Asia was inevitably entangled into global modernity, I examine the ‘soundings’ of modernities in Manila and Asia Pacific. My research surveys the spread of town bands and music theatre as part of the modernist aspirations of Singapore, Medan, and Shanghai. Consulting primary and secondary materials across different archives in Asia, I investigate the crucial role of the Manila musicians in this acoustic modernization project across the Asia Pacific. Centripetally, I examine the arrival of travelling musicians, theatre and opera companies which re-casted listening into an act of modern cultural consumption. Centrifugally, I trace the migration of Manila musicians as they engaged in the modernization project of its neighboring Asian cities. 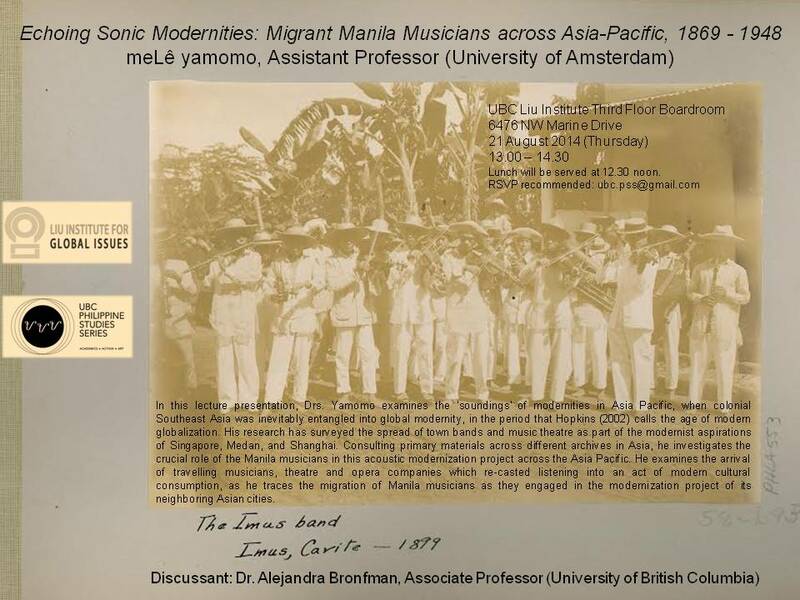 I piece together biographies, historical newspapers, and some surviving archival documents to survey some general patterns, and some specific details in the movement of modernities through the movement of sounds and ideas instigated by the migration of Manila musicians. To understand how modernity was imagined, heard and embodied, I explored the intersections of sound studies, theatre history, musicology, and performance studies. By synaesthetically comparing Hans Belting’s(2001, 2005) iconology theory into what I propose as an Anthropology of Sound, I argue that the sound of modernity is inextricably intertwined with its mediated form (music) and its embodiment. Taking the performing bodies of the Manila musicians as the locus of sound, I argue that the global movement of acoustic modernit(ies) was replicated and diversified through their multiple subjectivities within the entanglements of empire, nation, and individual agencies. Tags: colonialism, Filipino, Filipino Migrant Workers, globalization, Manila, performance, Philippines. Bookmark the permalink.